June 29, 2014, will always be a date to remember for Buchan folk - and in particular one Buchan family. On that Sunday, just 11 days after being told her leukaemia had returned, Catherine Melrose lost her battle with the disease. The 17 year-old student had remained optimistic throughout her treatment, but died at Aberdeen royal Infirmary surrounded by family and friends. Within minutes of her post, Sam and Catherine’s Facebook pages were flooded with messages of condolence, many praising Catherine’s bravery throughout her illness. Now, one year on, Catherine’s memory is as bright as ever and her incredible legacy has seen more than £100,000 raised for Anthony Nolan. Speaking to the Buchanie about the highs and lows of the past year, Sam told us: “Catherine lost her battle with leukaemia just 11 days after she was told her leukaemia had returned. “Many rounds of chemotherapy and a stem cell transplant had eventually seen her reach remission early in 2014 - something her specialists thought would never happen as her particular type of leukaemia had been so aggressive. “Tragically her remission was not to be permanent and in June last year she was offered no further treatment and lost her long battle on the 29th of that month surrounded by her family and friends - just as she had wished. And those wee red pebbles have certainly been travelling during the past year. They have been placed in the likes of Graceland in Memphis, on the seabed of the Atlantic during a scuba driving trip, at Hogwarts Express in Orlando, in the cockpit of an aeroplane and even at an elephant orphanage in Sir Lanka! Numerous fundraising events have also been held across the Buchan area. A charity ‘Touch of Red’ ball in memory of Catherine raised almost £3,000, while at the weekend a Cycle for Catherine helped swell the fund. “Just a few weeks ago her fundraising topped £100,000 - far more than we could ever have hoped we would raise,” said Sam. Meanwhile, on what would have been her 19th birthday this October, her friends will undertake a sky dive - something she challenged them to do! Sam continued: “This year of fundraising has involved so many people and so many events - it has been unbelievable. “Her friend Nicola organised a charity ball, we have sold hand-made red glass angels, and the pharmacies have held bake sales and book sales,” she said. “Many people have just made donations to her Just Giving page because they knew her or had read her story. “Her total grows each and every day. “Catherine’s pebbles are now all over the world and my favourite is the one inside Mary Poppins’ glove in Disney in Florida.She was Catherine’s favourite character. “Every day we have requests for more pebbles to be taken to amazing places by wonderful people,” she said. Away from the fundraising, Sam’s focus has been on making people aware of Anthony Nolan and getting them to sign up to become stem cell donors. 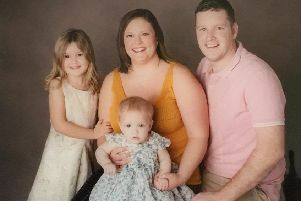 “Catherine made us promise we would continue to raise awareness of horrible conditions like leukaemia and the importance of people being blood donors, organ donors and, of course, stem cell donors,” said Sam. “For many patients like Catherine, a stem cell donation from a matched donor is life-saving. Every 20 minutes, someone in the UK is told they have a blood cancer such as leukaemia and for many a bone marrow or stem cell transplant is their only chance. They need cells from a healthy person - with the same tissue type - to replace and repair their own damaged cells. According to Anthony Nolan, about 30 percent of people in need can find a suitable donor in their family, but the other 70 percent rely on a stranger to save their lives. There are currently over 500,000 adults on their register, but they are constantly working to increase that number. Every time someone comes to them in need of a transplant they check the register for a match. And they make more than 1,000 matches each year. If you are between 16 and 30 - and in good healthy - you can sign up to the Anthony Nolan register (you stay on it until you turn 60). The charity can send you a spit kit in the post so that you can give them back a quick saliva sample. If you’re a match they will be in touch and will ask you to donate if you’re still healthy and happy to do so - it’s as simple as that! “Many hundreds more people are now on the register thanks directly to Catherine and her amazing friends,” said Sam. “Several of these have already been called up to donate their cells and in two years they will get the opportunity to meet the person whose life they may have saved. In recognition of her campaigning and fundraising, Catherine was commended in the 2014 Anthony Nolan Supporter Awards - a very proud moment for Sam. “We were delighted that Catherine had been recognised in this way,” she said. Speaking at the time, Henny Braund, chief executive at Anthony Nolan said: “Catherine Melrose was an incredible supporter of the charity as well as being an inspiration to us all during her battle with blood cancer. “Her legacy will continue to save lives, thanks to her fundraising efforts and her determination to raise awareness of the importance of donating stem cells.